Last Friday, five of us met at the Daily Bread parking lot at 5:30 AM for dawn patrol. 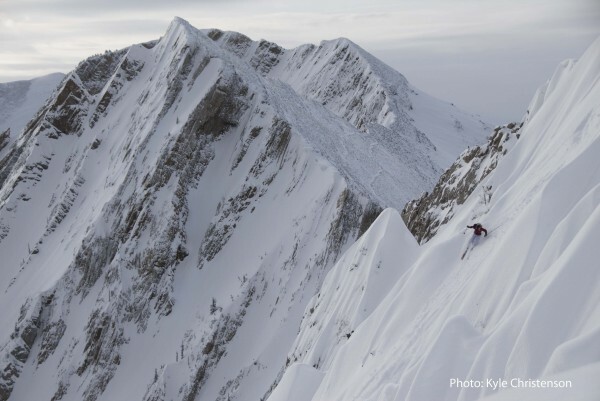 Kyle had made it up to Frazier Basin on Wednesday, they found stable conditions and the skiing excellent. Once I heard the possibility of going up on Friday, especially since Kyle has access to two snowmobiles slashing the multi-hour skin to Frazier Basin to less than a 30 minute tow- I was in. This was my first time to Frazier and I must say I was blown away. The North Bridgers have so many aesthetic looking couloirs- it is like God himself has carved each mountain vertically with a giant fork. The red glow of the sunrise hit us just as we made it to the saddle, we then prepared ourselves for our descent into the basin. One at a time we skied down the North facing access bowl making huge GS turns. The snow was soft, fast and predictable, this entrance into the basin was the perfect indication that it was going to be a great day. Because we went in on sleds, and the nature of the lines we intended to ski, we all had brought our “heavy” alpine gear- well one of us was on teles. Kyle and I had brought Alpine Trekkers and skins which made the jaunt across the bottom of the basin to access the main lines much easier than the other option which was post-holing across the basin. Once across the basin the real boot packing began. There had been a couple inches of snow between when Kyle was there on Wednesday and this had conveniently covered up the boot pack making progress slow on the first lap. 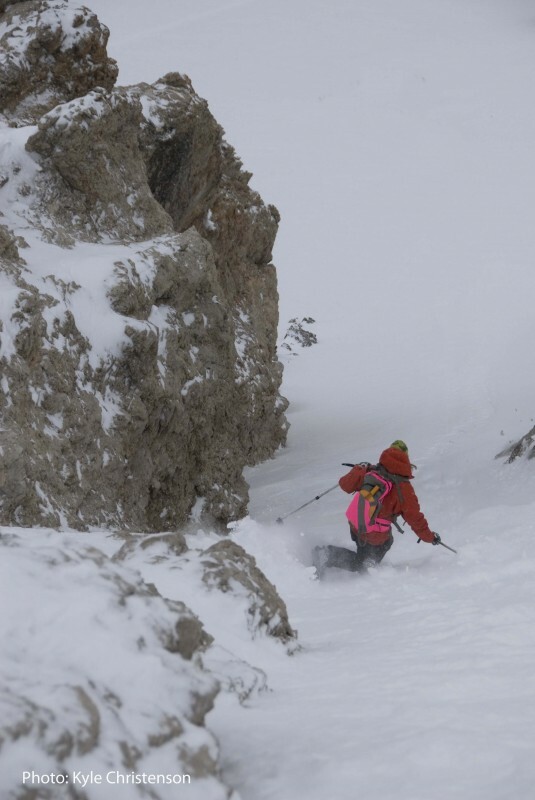 Once on the ridge, quads burning, we made it over to the aptly named Hollywood Headwall. The Hollywood Headwall looks like something that is in Alaska or Canada, not Montana due to some obvious fluted features. 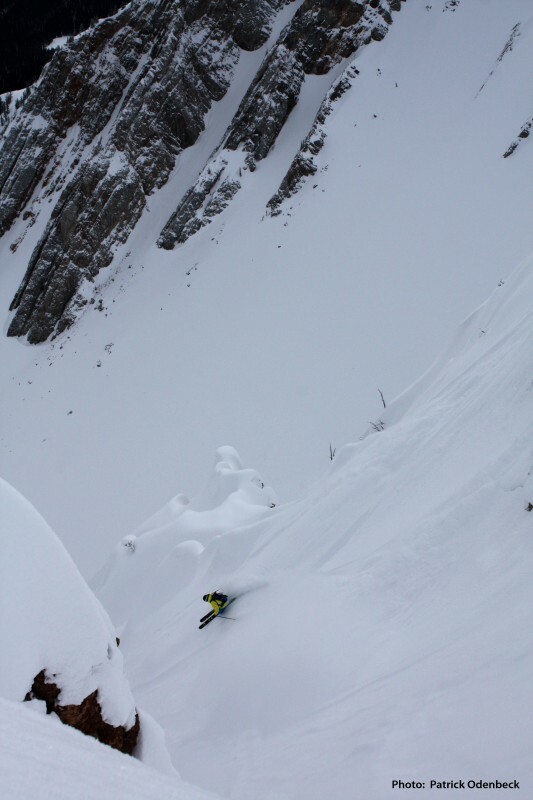 Johnny dropped in first and cruised through the cliffs and chutes below. I was up next, I picked a line that was just right of Johnny’s, the first turns through the flutes were fantastic. Then I met up with Johnny’s line exiting through an anemic chute. What a classic! I was psyched. This instantly gave me more fuel- I was up for another lap- Johnny was also up for another. So I kicked my way up the boot pack with the uber aesthetic Red Couloir in my mind. Kyle, Heidi and Blake made their way over to Red Couloir while Johnny and I were on our way up. I could hear them hoot and holler as they made their way down. This was going to be good. I quickly made it across the ridge to the entrance. The couloir’s skier’s left side has a bright red overhanging cliff that gives the couloir it’s name- so aesthetic and slightly ominous. I scan the entrance with my ski tips hung over the edge and drop in. The snow was certainly variable the left side under the cliff is crusty and the right side was soft and supple. 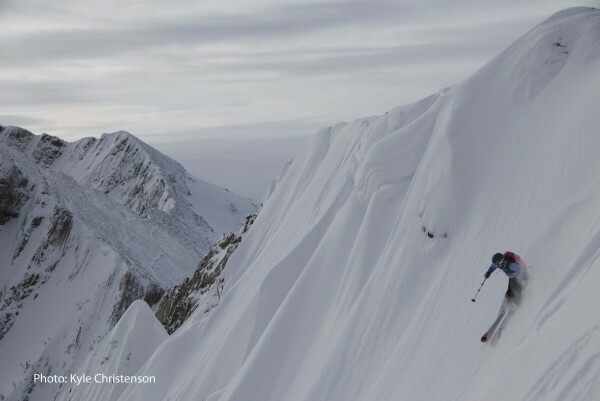 I let my skis go, making long GS turns speed increasing as I descend. Near the bottom I see what looks like a little roller. For some reason I decide it would be a great idea to hit it. As I closed in it turned out to be a rock barely covered by some snow… it was too late. My right ski kicked out and at that moment I thought, no I knew, I was finished. This was one of those times when you don’t know how you landed it- but you did. I was relieved because by that point I just flying out of the chute. At this point I had to decide whether to call it a day or catch up to the others and squeeze out another lap. I made it over to the boot pack and started ascending- I guess I am a masochist. I met up with the group right when they were dropping in to one of the first lines you come to when you get to the ridge. We dropped in one at a time. Blake working down the last line of the day. This line was narrow, but not too narrow and the snow was soft and creamy. This was a great line to end the day. To exit the basin we kicked steps back up to the saddle that we entered on. When we reached the saddle we all took one last look at the lines we had just skied and made our way out to the truck.